After coming for our guns and our grandparents, the government is now coming for our equally beloved, equally aging Saturday Night Live, warns credible assessor of threats Ted Cruz. The Republican senator sounded the alarm during the ongoing debate over a Democrat-proposed bill that would counter the Supreme Court’s Citizens United decision and once more give Congress the power to regulate campaign contributions from corporations who spend money to influence elections. As one of many who interpret this to mean that this will endanger free speech, Cruz—who’s blasted the proposed amendment as a “smoke and mirrors distraction”—argued against it by putting up lots of poster boards, then declaring it could all lead to the criminalization of SNL. “I grew up watching Saturday Night Live, I love Saturday Night Live. 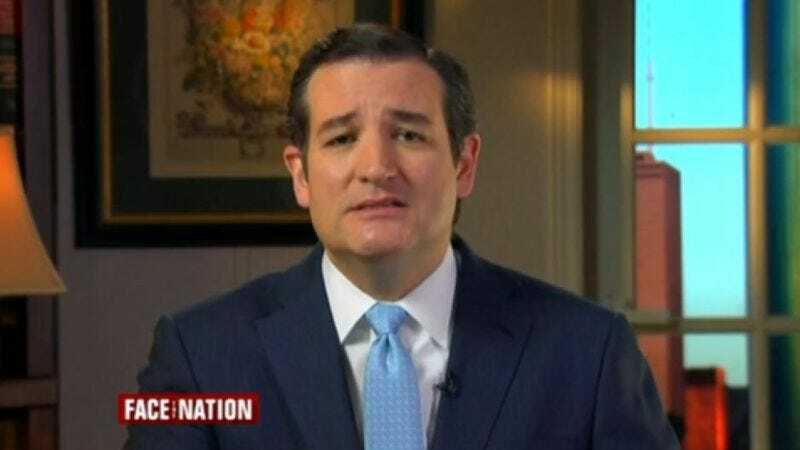 Saturday Night Live over the years has had some of the most tremendous political satire,” Cruz said, by way of establishing his connection to all SNL patriots. He then gave specific examples of that political satire, first reminiscing over sketches about Bill Clinton, Ronald Reagan, Al Gore, and George H.W. Bush—even offering his own take on Dana Carvey’s “Not Gonna Do It” catchphrase—then making his argument about how, if this bill is passed, Lorne Michaels will probably end up in jail. As with his Dana Carvey impression, no one was laughing. “Who can forget in 2008 Saturday Night Live’s wickedly funny characterization of the Republican vice presidential nominee Sarah Palin? It was wickedly funny and also had a profoundly powerful effect on people’s perception of Sarah Palin, a friend of mine,” Cruz said, noticeably not mentioning the show’s own portrayal of Cruz as a bloviating screwball who uses pop culture to bring undue attention to his grandstanding. Instead, he moved right along to how he’d asked one of the bill’s sponsors, “the good Senator from Minnesota”—former SNL cast member Al Franken—whether he believed Congress should be able to regulate SNL’s political satire. As Cruz reported, Franken told him he had “no intention” of doing any such thing. Fortunately, the bill is not expected to pass, before its potential criminalization of satire can be applied to people who have lapsed into self-parody.